(NewsUSA) - For many gift buyers, the tax refund is that extra paycheck that arrives just in time to pay off holiday bills. However this year, new provisions under the PATH - Protecting Americans from Tax Hikes - Act will impact early tax season refund timing. For tax returns that include the Earned Income Tax Credit (EITC) and/or the Additional Child Tax Credit (ACTC), the IRS will issue your refund no earlier than February 15, 2017. Last year, over 26 million Americans received EITC, meaning this change could surprise many who typically plan to get their refund early in the year. Jackson Hewitt Tax Service is responding with a way to help hardworking Americans bridge the gap and get access to money. Taxpayers may prequalify for an Express Refund Advance, a no fee, 0 percent APR loan offered by Metabank available when clients file their taxes with Jackson Hewitt. Those interested should visit www.ExpressRefundAdvance.com, answer a few simple questions, and within minutes see if they prequalify for up to $1300. There's no credit check, and visitors may prequalify with a refund as low as $500. "We are committed to helping our clients get early access to money," said David Prokupek, Jackson Hewitt CEO. "With expected refund delays this year Express Refund Advance is important for millions of hard-working Americans." Starting December 15 when Jackson Hewitt offices begin to open, clients may get started using their last paystub, and receive between $200 and $400. The loan is automatically repaid when clients receive their tax refund from the IRS. Jackson Hewitt kiosks located inside of more than 3,000 Walmart stores will also offer Express Refund Advance, and will open beginning December 27. 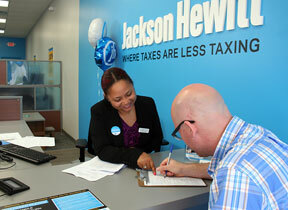 To learn more or to make an appointment with a tax pro, visit www.JacksonHewitt.com. The Express Refund Advance is a tax-related refund loan provided by MetaBank; it is not the actual tax refund. Available for a limited time and in participating locations. The amount of the advance will be deducted from tax refunds and reduce the amount that is paid directly to the taxpayer. Tax returns may be filed electronically without applying for this loan. Availability is subject to satisfaction of identity verification, eligibility criteria, application, approval, underwriting standards, and other terms and conditions. Only $200-$400 is available with a paystub (or other acceptable pre-year-end income verification), and remaining amounts are available with a W-2 and upon filing tax return with the IRS. IRS delays may affect the delivery timing of loan proceeds. Disbursement rules apply. Funds loaded onto a card within an hour and direct deposit the next business day. Ask tax pro for details.